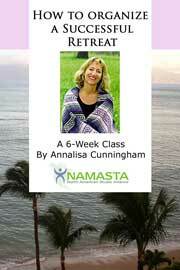 Annalisa Cunningham now shares her successful retreat secrets. Annalisa has been a retreat organizer for 20 years and she wrote best sellers on mind-body practices and “Yoga Vacations: a Guide to International Yoga Retreats”. She takes you through all the steps required to make your first, or your next, retreat a success for you and your participants. You start receiving this unique 8-week e-mail course as soon as you order. NAMASTA Members, please log in and visit the “Member discounts & privileges” section of the website to get a 10% discount.